Rue Paul Spaak 15, 1000 Brussel, België. Just off Avenue Louise, near the European Parliament, the shopping district, and nightlife, the Four Points by Sheraton Brussels keeps you in the center of it all. Plus, Brussels National Airport is only 16 kilometers away. Enjoy the convenience of state-of-the-art meeting technology and natural daylight in our new meeting room. Not to mention Wi-Fi in public areas. Unwind with your favorite beer in the bar or enjoy a delicious piece of pie at La Four’chette Restaurant. 128 newly-renovated guest rooms are spacious and comfortable. Little extras like High Speed Internet Access, the Four Points by Sheraton Four Comfort Bed, Lazy Boy armchairs, and a flat screen TV will make you feel right at home. We realize that your free time is valuable. Relax with your favorite beer in the bar or enjoy comfort food like a delicious piece of pie at the restaurant. We like to keep it simple and worry-free. If you’d rather stay in, room service is available for dinner from 6 – 10:30pm, with a limited menu on Friday and Saturday. The right place to stay in Brussels. 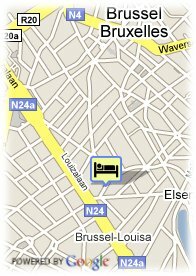 Four Points by Sheraton Brussels is near Avenue Louise and the European Parliament. The area comes to life with an array of shopping and nightlife. 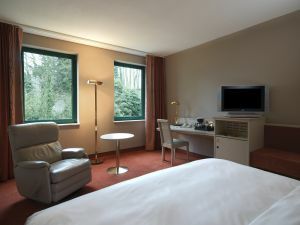 We’re just steps from the Grand Place and the central station and Brussels National Airport is about 16 kilometers away. Bus and tram stops are around the corner on Avenue Louise. See the city on one of the sightseeing tours which leaves right from our hotel.